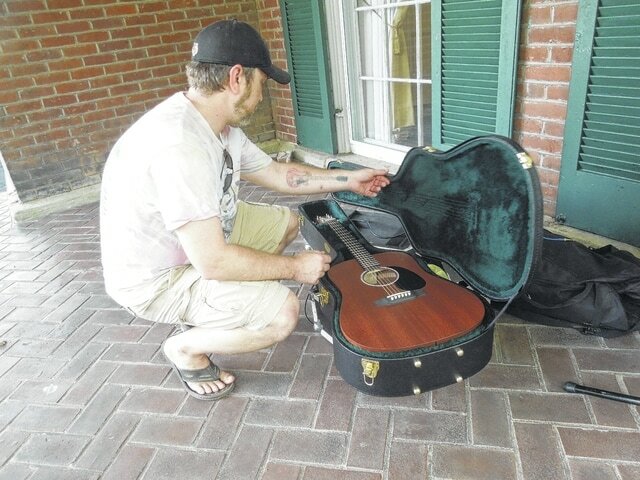 Mark Ward, a Gallipolis native and Ohio River Live board president, pulls out his guitar as he prepares to play outside the French Art Colony for “Hot Summer Nights” on Thursday evening. GALLIPOLIS — Gallipolis City Park will once again play host to Ohio River Live, a local music festival seeking to bring locals and out-of-towners in to celebrate regional artists. According to Mark Ward, Ohio River Live board president, the show starts 4 p.m. Saturday. Admission is free and the event is open to people of all ages. Food concessions will be available along the park and alcoholic beverages will be sold in an enclosed area. Identification must be provided to consume alcohol. Ward noted that Saturday’s event will be the fifth in Gallipolis City Park. John Wetzel, an artist known in the Athens area and a former player with the band Whip and Tickle, will be the first performer in Live’s lineup. As a solo act, Wetzel has been noted to play — and been inspired by — blues and various American artists. Wetzel is a known player of harmonica and guitar. “I’ve seen them play a number of times. They’re a very tight and talented act,” Ward stated about Ben Davis Jr. and The Dirt Poor Troubadours. Ward said the band does a lot of original work and that is something he always tries to support. As the main act, Ben Davis and the Dirt Poor Troubadours will be performing last. The band fuses its own version of alternative country and Americana. Ward said though that one needs to “hear them to really understand what they’re about” as the band takes inspiration from many places and that it is often hard to label a band’s style because each one is unique. “Ohio River Live. We’re a nonprofit organization and we were founded by a group of local Gallipolis citizens who wanted to do something to give back to the community. We put on these live events to not only bring some commerce to Gallipolis, but to promote tourism,” Ward said. “We like to work in conjunction with the Gallipolis Visitors’ Bureau and the (Gallia County) Chamber of Commerce. We will be taking over the leadership role in the upcoming Chili Fest after having worked with the chamber. Ward said the Chili Fest is traditionally around the first weekend in October. Details of that event are still being considered.